The water agency that serves Las Vegas is considering a $US 650 million pumping station that will protect its ability to draw water from Lake Mead, even as the big reservoir shrinks. Click image to enlarge. The board of directors unanimously approved the pumping station and seven other advisory committee recommendations, including adding a fixed monthly fee to water bills to pay for the $US 650 million project. The price of reliable water in the American desert – and the residual costs of steady demand under drying conditions – keeps rising. On Wednesday, the board of directors of the Southern Nevada Water Authority (SNWA), the regional wholesaler that serves Las Vegas, will consider endorsing the construction of a $US 650 million pumping station that will draw water from the deepest depths of Lake Mead, the Colorado River reservoir that provides 90 percent of Sin City’s water supply. A 21-member advisory committee, appointed by the board, recommended last month that the pumping station be designed and constructed “within the swiftest feasible timeframe.” Without it, the committee argued, the oasis city of 600,000 residents — and 40 million annual visitors — runs an unacceptably high risk of being cut off from its primary water source if Lake Mead continues to drop. The water authority’s two existing intakes will be exposed to desert air if the lake’s elevation drops below 1,000 feet above sea level. A third intake is currently under construction, but it would require a separate pumping station — like the one that the committee recommended — to operate at the lowest water levels, those below the 1,000-foot mark. The surface of the lake now stands at 1,084 feet, having plummeted 130 feet over the last 14 years, the driest period on record for the Colorado River Basin. It could take five years to design and construct such a pumping station, according to SNWA spokesman Scott Huntley. Because of the committee’s unanimous endorsement, the board is likely to approve the pumping station, according to Mary Beth Scow, board chairwoman. 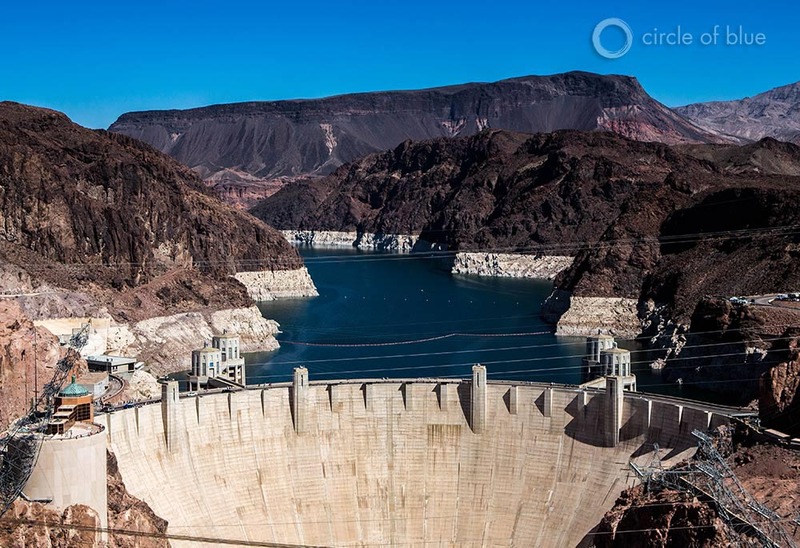 SNWA is one of four large utilities in the Colorado River Basin that will work with the federal Bureau of Reclamation on water-conservation projects that increase water storage in Lake Mead to avoid a first-ever shortage in the Basin. The SNWA board is expected tomorrow to approve its participation in the $US 11 million project that was announced this summer. The four states in the Upper Colorado River Basin developed a similar conservation program this spring to prop up Lake Powell, a large reservoir that is located upstream of Lake Mead. Phoenix and Tucson, often ideological opposites, agreed in September to coordinate water deliveries and use each other’s canals and groundwater storage basins to maximize their capacity to use Colorado River water. San Diego, which is not in the Basin but still uses Colorado River water, will soon buy water closer to home – from the largest desalination plant in the Western Hemisphere, under construction in nearby Carlsbad. Opening next year, the $US 1 billion project will reduce San Diego’s reliance on water imported from the Colorado and Northern California. Las Vegas, too, will complete an expensive capital project next year. SNWA is building a third pipe to draw water from Lake Mead. The $US 817 million, three-mile-long conduit will poke up from the deepest parts of the lake, at an elevation of 860 feet. But to function at such dismal water levels – when the lake is so low that it essentially reverts to being a river again – the intake will need the new pumping station. The two existing pump houses operate only to elevation of 1,000 feet. The third intake was originally designed with a connected pumping station. But the recession in 2008 put the brakes on new construction in Las Vegas and whittled to the bone the fees that SNWA collected from new housing developments. Used for water infrastructure projects, connection fees fell from $US 188 million in 2005 to $US 3 million in 2008. Shelved as a budget-cutting measure six years ago, the pumping station is now back on the drawing board because of the continuation of the drought, said Huntley, the SNWA spokesman. Combined with the third intake, the pumping station will allow SNWA to draw water even if Lake Mead falls below the 895-foot “dead pool,” the elevation below which the dam cannot release water downstream. Bureau of Reclamation computer models show a 10 percent chance of Lake Mead falling below 1,000 feet — the elevation at which SNWA’s two current pumping stations are rendered useless — by 2025. But those models look only at river flows and precipitation observed in 119 years of record keeping. Factor in the drier conditions that are expected in the Southwest as the planet warms and the chance of Lake Mead dipping below that critical level reaches 25 percent by 2020. Thus the advisory committee’s urgency. The committee suggested that SNWA pay for the project by adding a fixed fee to utility water bills. The fee, phased in over three years, would increase a typical residential water bill by $US 4.81 per month. The board of directors is not bound by the committee’s recommendations. Huntley said that the board could adopt certain items and reject others. The committee also recommended that SNWA continue pursuing a highly contentious pipeline to groundwater basins in central Nevada as a water-supply option. The pipeline has been mired in legal battles for more than a decade. If the board does approve the pumping station, the facility could be ready by the end of the decade. It could be operable by 2019, Huntley asserted – one year for design work and four years for construction. I don’t know what to think of this project. If the level of Lake Mead goes below 895 feet, you cannot pass a drop past Hoover Dam, so whatever water from western Rocky mountain snow melt fills Lake Mead and Lake Powell, goes nowhere. Not to California nor Arizona. The two biggest users of Lower Colorado River water are removed from the equation, and Nevada, with its paltry 300KAF/year allotment is worried? How does Lake Mead not go up from that level or from 1050 feet, when other agreed upon water cutbacks take effect? With no water filling Lake Mohave, how does the Colorado Aqueduct move water to CA, and the Central AZ Project move water to AZ? Does not happen. Not only is there no water to do this, but there is no power being produced by Hoover, Davis or Parker Dam to move the water. I won’t even hypothesize how electrical power is going to be stabilized in the Mountain Region or the Desert Southwestern Region without hydroelectric load-following maintaining frequency, or supplying/condensing volt-amps-reactive fluctuations of the regional power lines. The perceived problem will be solved by the free market economy when Irrigation Districts are forced to spend too much capital on water supplies for various water-heavy crops, citizens are forced to spend too much of their limited income on water to spray on their grassy lawns, desalinization becomes financially logical for coastal communities, higher water line fees make new home construction financially prohibitive, LA home owners jump at the $3/sf rebate for losing their lawns and adopting xeriscaping, states drop the laws against rain harvesting, home based solar power increases in popularity due to lowering cost/increased solar cell efficiency (displacing power production that requires water resources for equipment cooling), and finally, the cyclic weather patterns that have throughout history have changed, back to a wet season, refilling reservoirs, and recharging groundwater storage…and here comes a storm from the West, prepared to dump huge amounts of rain and snow all over the West…adding to my confusion. Or- your population could move to where there is plenty of water- Alabama. Alabama is home to more than 77,000 miles of rivers and streams, and ranks fifth in the nation in plant and animal diversity, and first in freshwater species diversity. The Cahaba River is home to 131 different species of fish—more species per mile than any river of its size in the country. It also provides habitat for fresh-water mussels and aquatic insects found nowhere else in the world. About 70 % of Alabama’s land area is in forests. Timberland increased by 1.1 million acres over the last 30-years. Come one, come all! Everyone is welcome. “Between 1900 and 2008, U.S. groundwater reserves dropped by nearly 1 trillion cubic meters (264 trillion gallons) or enough water to fill Lake Erie— twice”. Hey Skip, I lived in AL for six years, and enjoyed it a great deal. Loved the bar-b-q chicken (hickory smoked from Whitt’s is my favorite), but I’ll eat Big Bob Gibson’s in a “heart-beat”, but something you might want to look into is the water quality of the Tennessee River and ask yourself why so many people that fish the river for food, have astronomically higher rates of cancer than anywhere else in the country. As someone who lived there, and had to install a reverse osmosis system on their water supply due to health concerns, I’d say that you may be exaggerating the nirvana of the water supply. The Cahaba river is wonderful in its aquatic diversity, but living in an area is more than just one river. I’d also like to know what “your population” means. Are we not all human? Are we not all Americans? You probably just phrased it in a stilted manner. You may remember a few years ago when Atlanta almost ran out of water, and recently Tampa Bay and right now Wichita Falls is on the edge of running out of water. As humans, we reach for the stars and sometimes over-reach and nature deals us a shortage of resources, and we have to collectively run risk vs. reward calculations. That’s what we do. We’re gamblers. We shoot for the stars and try to accomplish crazy things, like shooting rockets to the moon, while our dogs tilt their heads and wait on their bowls to be refilled. We’re players. Don’t hate the player. Hate the game.